GO TO DENMARK FOR 3 YEARS AND GET AN EXTENSION OF 4 YEARS. ENABLES YOU TO WORK IN DENMARK. APPLY WITH SPOUSE AND CHILDREN. SPOUSE CAN WORK AS WELL AS STUDY. A PERFECT GATEWAY TO PERMANENT RESIDENCY IN DENMARK. ELIGIBILITY: Phd. / MASTER'S DEGREE HOLDERS WITH MINIMUM 1 YEAR OF WORK EXPERIENCE CAN APPLY. HOT PROFESSIONS: IT, HEALTHCARE, MANAGEMENT, ENGINEERING, SOCIAL AND RELIGIOUS WORK, ACADEMIC, ETC. Single Applicant - INR 12850 app. kindly mail your resumes for initial assessment. Free of cost assessment. ­As a new batch of international students prepares to make the move to Canada for the Fall semester, others are considering their options for 2016. When it comes to studying in Canada and thinking about settling permanently, preparation is the key. OM international present you the best opportunity for student visa to Canada and settle after finishing your studies. 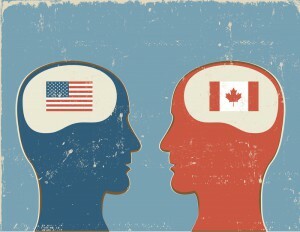 Chances of Permanent residency of Canada straight after finishing studies. Many individuals, however, are seeing their future academic and professional career prospects not just in Canada, but specifically in the province of Quebec. Quebec welcomes approximately 45,000 immigrants each year, a figure that is progressively rising. Why is this? Quebec is a culturally, linguistically, and historically unique province of Canada, with a majority French speaking population. Contrary to popular belief, however, not all colleges and universities in Quebec require French. Indeed, some of the most renowned institutions are predominantly English in character. The province offers study options in a dynamic and lively atmosphere. McGill University, Laval, Bishops, L’Université de Montreal, and Concordia, as well as many other universities and modern polytechnic colleges, are located here. The city of Montreal, Quebec’s metropolis, is home to four sizable universities, giving it the highest percentage of university students in its population of any major North American city, except Boston. Om International offers some of the best intuitions in Quebec for higher studies. We have a variety of option for courses to study. We give IELTS coaching to increase your chances of getting a Student visa to Canada for free once you register your interest to study in Canada. 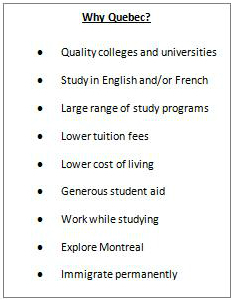 Quebec is also home to one of the most affordable education systems in North America. The average yearly tuition paid by Quebec students is the lowest in Canada, and the province offers a number of generous student aid programs. For students looking for English, French, or bilingual education, the system of schools in Quebec include a network of institutions that offer world­class education in both of Canada’s official languages. Individuals thinking about coming to study in Quebec should know that the province’s education and immigration opportunities are slightly different to the rest of Canada. Choosing the right combination of education and settlement options, therefore, can save time, money and stress. A typical path from student to permanent resident status in Canada is through taking advantage of something Canada offers that is not available, or more difficult to obtain, in other countries — a post­graduate work permit. Om International will even help you out with the work permit in Canada after finishing your studies. Come and visit our professional staff who will manage everything for you. This work permit may be issued on completion of the study program for the duration that the program, up to a maximum of three years. Thus, a graduate who completed a four ­year study program could be eligible for a three ­year post­graduate work permit, while a graduate who completed a study program twelve months in duration could be eligible for a twelve­month post­graduate work permit. 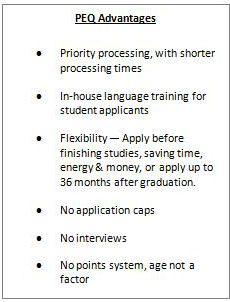 Students must be at least 18 and in possession of a valid study permit when applying. Click here to learn more about the post­ graduation work permit and eligibility requirements. Transitioning from temporary to permanent status in Quebec is a two­ step process. First, when successful applicants are chosen by the province they receive a Quebec Selection Certificate (commonly called a CSQ). Once in possession of a CSQ, applicants then submit an application for Canadian permanent residence to Citizenship and Immigration Canada (CIC) and undergo health and criminal background checks. There are many option Om International can help you with in regards to Canada Permanent Residency. We can help you out with all the immigration issues. 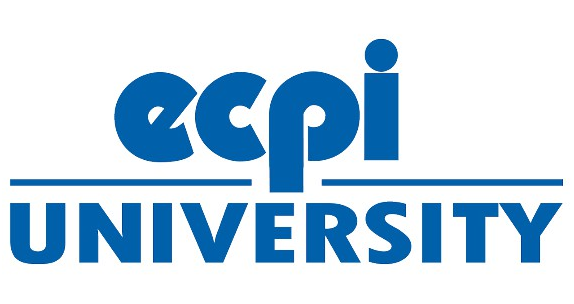 Immigration options for current and future students in Quebec can look toward the Quebec Skilled Worker Program (QSWP) and Quebec Experience Class (commonly known as the PEQ, or Programme de l’expérience québécoise). If a student is finishing his or her studies in Quebec and holds a valid CAQ (Quebec Acceptance Certificate) and study permit, he or she may be eligible to apply to the QSWP. Candidates who have studied in Quebec must have completed at least one half of an eligible study program and be ready to enter the workforce. The QSWP uses a points­based system to assess applications of individuals who wish to settle in the province. A more student­ oriented pathway to Canadian permanent residence is the PEQ. This program operates a stream dedicated to providing international students in Quebec with the opportunity to build their lives and careers in Quebec. · A DEP – Diploma Of Vocational Studies, followed by an ASP (Attestation Of Vocational Specialization; Attestation De Specialisation Professionnelle) comprising a minimum of 1,800 hours of training and leading to a particular trade. Students must have received their diploma from a school recognized by regulated by the Ministère de l’Éducation, du Loisir et du Sport (MELS), Quebec’s Ministry of Education. Proven advanced intermediate or better French language proficiency. Students must have completed an eligible program within the last 36 months or plan to complete a program within the next six months. “Newcomers come to Quebec each year from over 100 countries, helping to contribute to the multicultural character of the province and driving the Quebec economy. This includes a good number of students,” says Attorney David Cohen. Om International is a leading consultant of Vadodara providing immigration services to our valued clientele over a period of 15 Years…..visit us for a free of cost evaluation on your first visit. We provide immigration advice for Canada Permanent residency, Australian permanent residency, New Zealand Permanent Residency and also student visa option to different countries along with business visa, tourist visa, and many more……. 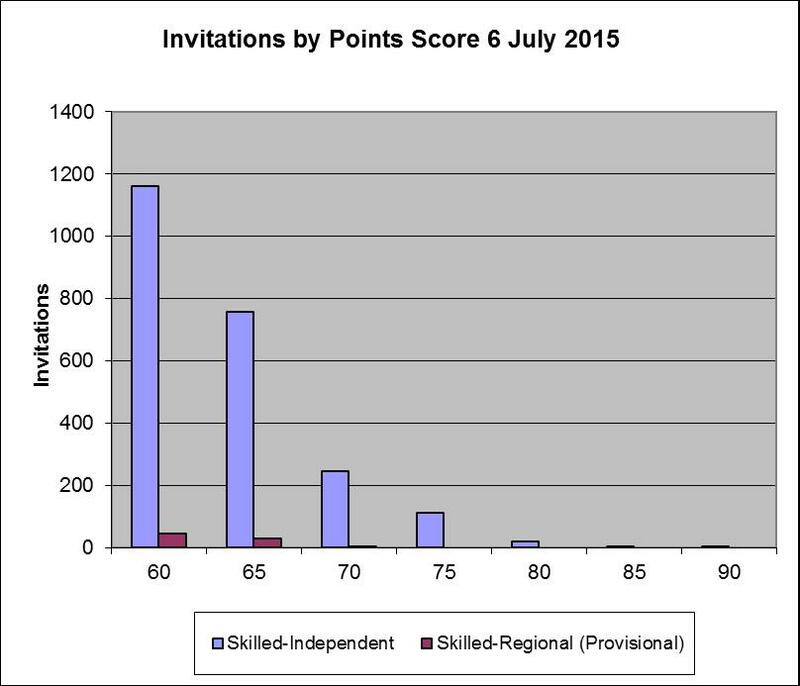 The table below shows the number of invitations issued in the Skill Select invitation round on 6 July 2015. Om International bring you the latest updates on the immigration news. Immigration Australia has recently provided with the figures below. We are dedicated to serve you the best possible way we can. our staff are highly trained and professional's providing you the true and transparent knowledge to migrate to Australia, Canada and many other countries. we also provided others services such as student visas, partner visa, business visa, visitors visa etc. 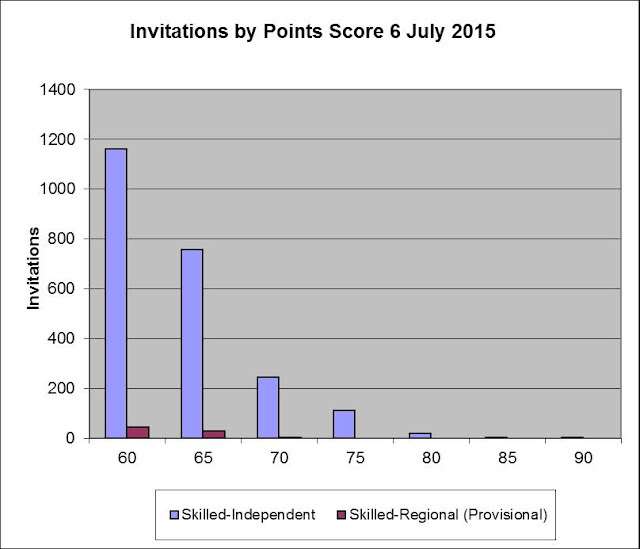 The following graph shows the points for clients who were invited to apply in the 6 July 2015 round. The points score and the visa date of effect cut-off for the above occupations in the 6 July 2015 invitation round is as follows. Below points score and visa date of effect is for Skilled Independent (subclass 189). Points scores and the visa dates of effect cut off for the above occupations in the 6 July 2015 invitation round.